Scoring highly in tests for dexterity, comfort and protection, the Southcombe Firemaster Ultra Premium Gauntlet offer a great level of protection for structural firefighting. Made from high quality materials such as Kevlar and Pyrohide leather and accredited by NFPA, EN 659, EN 388 and EN 407 standards, you can trust these gloves to be effective. The Firemaster Ultra Premium Gauntlet is Southcombe's flagship premium firefighting gloves, utilising the most advanced design to offer the best quality of protection. The Southcombe Firemaster Ultra Premium Gauntlet is suitable for use by firefighters for structural firefighting, having been certified to EN 659, the European standard for firefighting gloves and NFPA 1971-2013, an American equivalent. The gloves may also be suitable for other people who need protection against fire and extreme heat, depending on the specifics of the situation. Pyrohide leather is exclusively manufactured in the UK by Southcombe and is ideal for resistance against heat, fire, water, salt-water, liquid chemicals (including sulphuric acid, hydrochloric acid, caustic soda, ethanol et cetera) and Man Made Mineral Fibres (MMMF). The Southcombe Firemaster Ultra Premium Gauntlet utilises pyrohide leather for greater general protection. Pyrohide is used by 51 out of the 61 fire brigades in the UK and retains tactile properties in dry or wet weather. Kovenex is an inherently flame resistant blend on non-chemically treated performance fibres that provide outstanding heat-blocking. The Southcombe Firemaster Ultra Premium Gauntlet uses a Kovenex lining that is flexible, durable and offers cut resistance as well as heat resistance. Kovenex provides great levels of dexterity — no other thermal barrier offers as much heat protection while allowing these levels of dexterity. 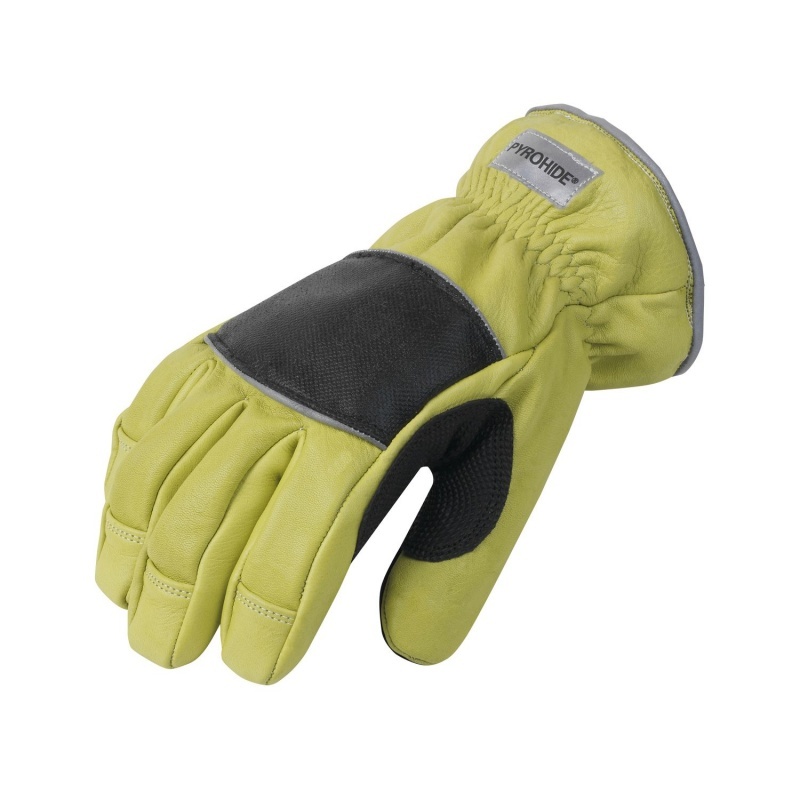 On top of a lining and a shell, the Southcombe Firemaster Ultra Premium Gauntlet features an interlining that offers better protection against heat. The interlining of the glove is a Gore Crosstech insert that is resistant to pathogens and liquid penetration against blood and bodily fluids. The Crosstech membrane performs five times more efficiently than competitive polyurethane-based products. The interlining is chemically bonded to the lining, ensuring that they don't become inverted while in use. Your knuckles are one of the areas of your hands that are most at risk from injuries. The Southcombe Ultra Premium Gauntlet features an FR-coated Kevlar patch that covers the knuckles to add protection against cuts and abrasion. The Kevlar patch also has the advantage of providing a little extra protection against heat threats. Southcombe understands the problems that firefighters face on a daily basis and to ensure that you have the best protection, they have carefully designed the Firemaster Ultra Premium Gauntlet with certain features. The most prominent feature of the gloves is that they feature a curved-finger 3D design, mimicking the natural position of your hands to provide greater comfort and dexterity. 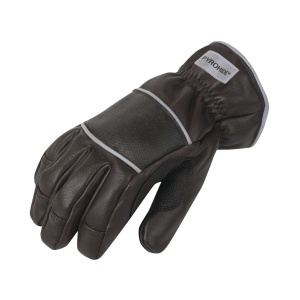 The gauntlet also have a digital Pyrohide leather patch on the palm that enhances grip in both wet and dry situations. By using a gauntlet style of cuff rather that the knitted wristlet of the original gloves, the Southcombe Firemaster Ultra Premium Gauntlet is ideal for easy donning and removal. Certain people may also find the additional room afforded by a short gauntlet cuff more comfortable than a more tightly fitting, elasticated cuff. When you are dealing with extremely hot environments and fire, it is essential that you have gloves that you know can protect you. The Southcombe Firemaster Ultra Premium Gauntlet has been certified by both NFPA 1971-2013 and EN 659, meaning that they are ideal for structural firefighting. The Southcombe Firemaster Ultra Premium Gauntlet is available in nine different sizes and two different colours (lime and brown). To measure which size you need, please measure your dominant hand (whichever is larger) by making a fist and measuring the tape around the widest part (between your thumb and index finger). Refer to the table to discover the size of glove that is necessary. As the Southcombe Firemaster Ultra Premium Gauntlet costs more than £40.00, they qualify for our free delivery within the UK. Unfortunately due to the fact that these gloves are made to order, your order may take between 8 to 10 weeks to arrive — please bear this in mind before ordering.